(MissionNewswire) Through donor support of its “Clean Water Initiative,” Salesian Missions, the U.S. development arm of the international Salesians of Don Bosco, was able to assist Salesian missionaries at the Kinyerezi Children’s Center in Dar es Salaam, Tanzania to provide youth access to clean water. The water project is directly benefiting 150 orphans and street children enrolled in the program and indirectly more than 3,000 youth who access the center’s health, education, recreational facilities and counseling services each day. Like many poor nations around the world, Tanzania struggles to provide clean, safe water to its citizens. Nearly one-third of the country is arid to semi-arid and people not living near one of the three major lakes that border the country have difficulty accessing water. Ground water is the primary water supply throughout the country but wells are often few and far between. In many instances, wells are located near toxic drainage systems, which leak into the fresh ground water and contaminate it. According to UNICEF, as a result of a lack of access to safe, clean water for drinking, cooking and bathing, water-borne illnesses such as malaria and cholera account for close to half of the diseases affecting the population. The city of Dar es Salaam is the worst hit region in the country by HIV/AIDS. According to UNICEF, more than 250,000 children are orphaned yearly by the disease. HIV/AIDS is a major public health problem for the city with families disintegrating due to stigmatization, unfaithfulness, high poverty levels, prostitution, rapid urbanization and unemployment. Many children who have lost one or both of their parents turn to the streets for survival. Salesian missionaries operate four Salesian centers in Dar es Salaam that provide education, workforce development programs, health services and assistance to street children. The Kinyerezi Children’s Center has been established to provide street children and orphans a place to call home and will provide them with an education, rehabilitation and psychosocial support. Many of the center’s structures and programs are still in development, and this clean water project will ensure youth have access to clean water they need. The water will be used for drinking, bathing, sanitation and the small-scale food production planned at the center. The project entailed drilling a bore hole and constructing a reservoir tank and piping within the institutions as well as installation of full grid electricity power supply to power the submersible pump. Once it was completed, youth in the program, as well as those living in the surrounding communities, were able to enjoy clean, fresh water. 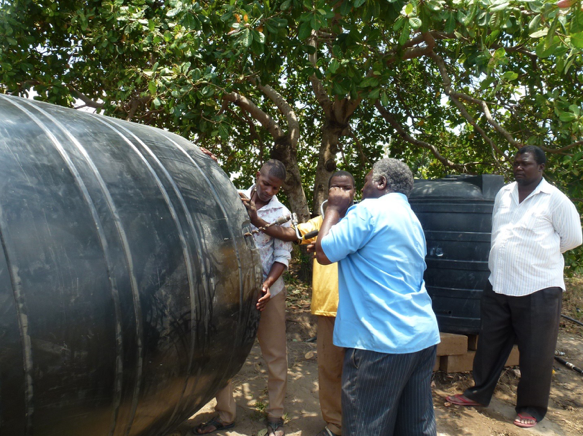 One community resident, Joseph Luwi, noted that because of the newly accessible water he no longer has to travel great distances to find water or pay for it. Now he is able to stay right in his own community and access water for free. Almost one third of people in Tanzania live in poverty, according to UNICEF. While the country has seen some economic growth in tourism, mining, trade and communication, the number of Tanzanians living below the poverty line has marginally increased due to rapid population growth. In some regions, up to half of the population struggles to meet the cost of essential food and shelter and other basic necessities like clothing, health care and education. To learn more about the Salesian Missions Clean Water Initiative, go to SalesianMissions.org/water.